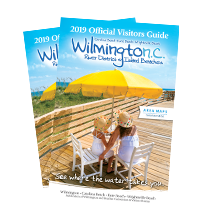 The City of Wilmington has 800+ metered spaces downtown, three parking decks and two surface lots. Decks on 2nd Street are free the first 90 minutes. You can park free of charge at on-street meters after 6:30 p.m. daily and all day Sunday. Parking in metered spaces is $1.50 per hour and is enforced Monday - Saturday, 9:00 a.m. - 6:30p.m. Click here for the location/fees for the city’s three parking decks and two surface lots. Metered on-street parking for those with properly displayed, valid handicapped placards is free of charge. Learn more about parking in downtown Wilmington. For more comprehensive handicap information, visit ACCESS North Carolina. From October 1 - March 31, dogs are allowed on the beaches and must be on a leash at all times. Dogs are prohibited on Kure and Wrightsville Beaches from April 1 - September 30. Carolina Beach allows dogs on the beach before 9 a.m. and after 5 p.m. from April 1 - September 30. Owners must always remove their dog’s waste. For a list of lodging facilities that allow pets in guest rooms click here (choose Pet Friendly under Amenities) or call 866-534-0845 for local kennel information. All of our beaches are USLA Certified with lifeguards on duty every day from Memorial Day weekend thru Labor Day weekend. Sales and use tax on purchases, including food, clothing, and other retail are taxed at the rate of 7%, grocery store food designed to take home is 2%, and prepared food at restaurants is 7%. In addition to the 7% sales tax, there is a local county room occupancy tax at a rate of 6%.